If you’re looking for a 3D printer to produce e-NABLE devices, we have some great options for you! Our partners offer special deals for e-NABLE volunteers. A portion of every sale goes towards supporting enablingthefuture.org and the e-NABLE community. Not sure which 3D printer is right for you? Send an email to our friends at 3D Universe, and they can help you to find a printer that’s a good fit. For makers that enjoy rolling up their sleeves, the Ultimaker Original Plus is a perfect fit. The Original Plus Kit is also ideal for enthusiasts that are budget-constrained, and yet want to have access to Ultimaker quality. The Ultimaker 2+ is one of the most advanced, precise and reliable desktop 3D printers available. Winner of the 3D Hubs Best of Prosumer 2017 award. The Ultimaker 2 Extended+ offers all the great features of the Ultimaker 2+, with an expanded build volume of 8.8 x 8.8 x 12 inches. The new Ultimaker 3 adds dual extrusion to Ultimaker’s industry-dominating technology. With a host of new, intelligent features, the latest generation of Ultimaker technology is a technical tour de force. It demonstrates that Ultimaker is serious about meeting the growing demand for accessible, professional 3D printing. The Ultimaker 3 Extended offers dual extrusion and all the other great features of the Ultimaker 3, with an expanded build volume of 8.5 x 8.5 x 12 inches. Looking for the best available desktop 3D printer with a large build volume? Look no further than the new Ultimaker S5. With simple setup, high uptime, and reliable dual extrusion, the Ultimaker S5 is the complete professional 3D printing solution. 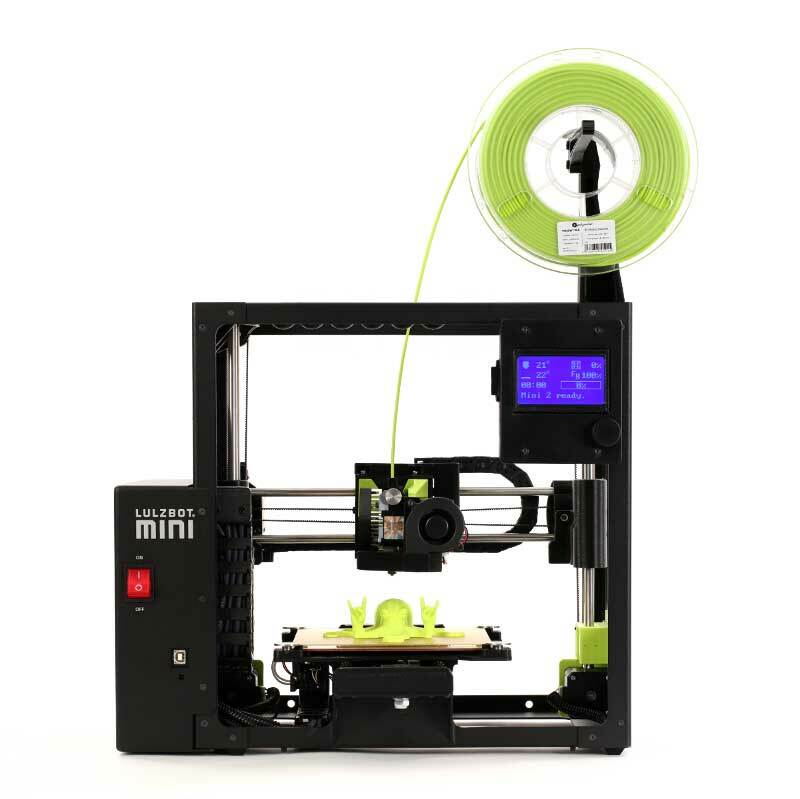 The Lulzbot Mini 2 is the latest generation of a well-reviewed small printer with auto leveling and excellent community reputation. The Lulzbot TAZ 6 is a large format workhorse for those who need to print big. Make Magazine’s top pick from 2016! The Dremel 3D40 is a safe and quiet desktop 3D printer with a fully enclosed workspace. This printer offers 100 micron build resolution, a clog-resistant extruder, Wifi and Ethernet connectivity, a touchscreen with onboard software, a removable glass build platform, and a one-year limited warranty. 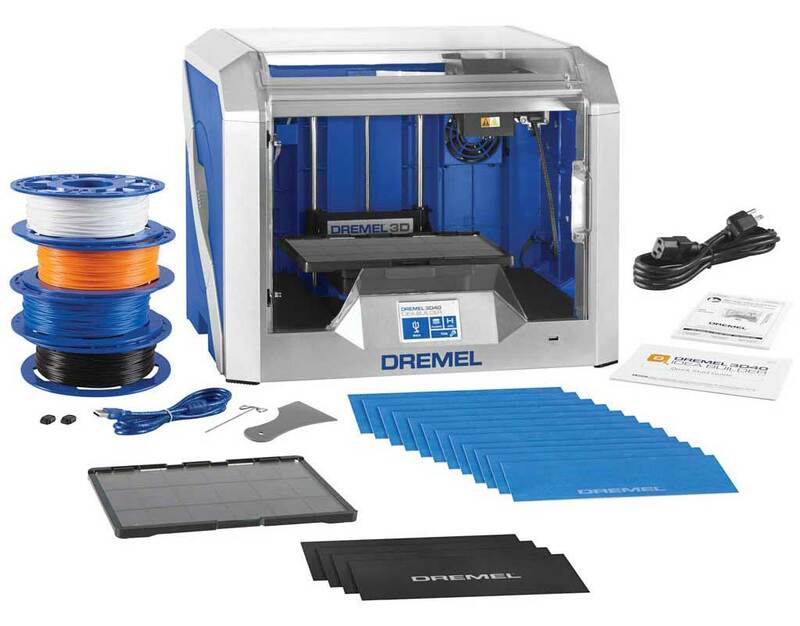 The Dremel 3D45 is a safe and quiet desktop 3D printer with a fully enclosed workspace. This printer offers 50 micron build resolution, a heated bed, automatic filament recognition, a clog-resistant extruder, Wifi and Ethernet connectivity, an onboard HD camera, a touchscreen with onboard software, a removable glass build platform, an integrated carbon air filter, and a one-year limited warranty.